Last week I was experiencing a mini-reading slump, and because nothing on my TBR shelf was intriguing me, I decided to go on the hunt on Amazon for an ebook that would hopefully spark up my reading desires. Let me just say, this book did that AND MORE! I wasn't expecting to enjoy Anew as much as I did, but I couldn't put this book down! Anew opens up with our main character, Scarlet, waking up in the woods with no memories of her life. All she is able to remember is her name and that she's fifteen. Fast forward two years and Scarlet still has no memories of her life prior to two years ago, but life has changed. Now Scarlet lives with her cool guardian Laura, and has a best-friend named Heather (who by the way, made me laugh...LOTS)! One night when Heather drags Scarlet to the Kissing Festival, Scarlet meets Gabriel-- a hot, brown eyed boy whose voice rings familiarity. After spending lots of time with Gabriel, Scarlet discovers Gabriel has a twin brother named Tristan who she feels an intense connection to. Confused by the feelings she's having, Scarlet's world gets turned upside down when she finds out the twins are linked to her past. Let's first discuss this love triangle. Surprisingly enough, I feel like it's been a couple of months since reading a novel containing a love triangle....mind you, I've purposely been avoiding them, but still. When reading the synopsis, it's pretty obvious the love triangle plays a pretty big role in Anew, but despite my initial hesitation, I went for it anyway. However, that being said, I'm pretty impressed with the way the author developed Scarlet's relationships with both Gabriel and Tristan. I definitely think the person who Scarlet belongs with is pretty obvious, but Scarlet's conflicting feelings make sense, and I believe that is why I've been enjoying it so much. I'm rooting for Team Tristan all the way (fictional bad boys always seem to win me over)! It's hard to really explain my love for this book without giving away spoilers of the main plot-line, but I will say that Anew has this Evermore vibe, but is MUCH better because the Evermore/Immortals series by Alyson Noel isn't my favourite. I also really enjoyed Scarlet's character! As opposed to freaking out when she found out about her past and the curse that has haunted her for years, Scarlet takes initiative and fights for the life she wants with no whiny-ness in sight! She tucked her lips in and eyed the pancakes Tristan pulled from the pan. "Making a midnight snack?" She tried to sound light and casual. Normal. Friendly. Not because Tristan deserved it, but because she wanted pancakes. And Tristan, apparently, was keeper of the pancakes. Overall, if you're looking for something a little bit different and filled with passionate hot fellas, Anew should be on your radar. The ending left with such a cliffhanger that I'm excited to finish writing this review and rip open book two! 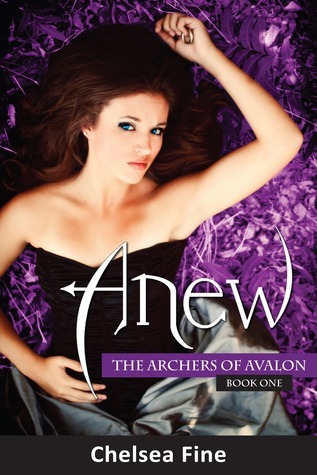 Have you read Anew? What are your thoughts on love triangles? Be sure to let me know in the comments below! Keep Reading! Wow... I just finished this book and wow. It was great, the ending was superb. It leaves you completely hanging. I cannot wait until the sequel comes out. The book is about curses, immortals, and love.